Original source: All-American Ads 1900-1919. Manolo was interested in the style of the shoe; my own interest is in the Sorosis name. How did a word that sounds like a disease (cirrhosis? psoriasis?) become a brand of “the most distinctly fashionable shoes that are on the market”? Was there a relationship, I wondered, between Sorosis and “sorority”? Or with the Sorosis clubs for professional women, which had been founded in New York in 1868 and are still thriving in some U.S. cities? Or maybe (I wondered whimsically) with Yiddish tsuris? 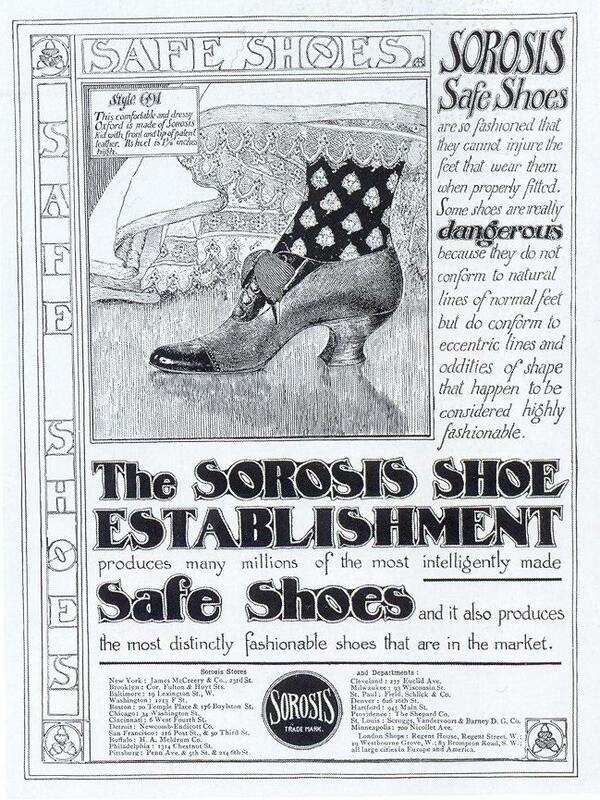 Sorosis shoes were manufactured by A. E. Little & Co. in Lynn, Massachusetts. In the late 19th and early 20th centuries, Lynn was “the shoe-making capital of the world,” thanks largely to Jan Matzeliger, inventor in 1882 of the first shoe-lasting machine. Matzeliger was born in Dutch Guiana (now Suriname) to a white Dutch father and a black Surinamer mother; he left Suriname at 19 and eventually landed in Lynn, where he found work in a shoe factory. At the time, shoes were cut by machine but finished by hand; a skilled shoemaker could make 50 pairs in a ten-hour day. Matzeliger’s machine could make 150 to 700 pairs a day. The dramatic increase in productivity cut the cost of shoes in half. Sorosis ad, 1898, via eBay. Back to my original question: Where did the Sorosis name come from? Sorority came into English in the 1530s with the general meaning of “sisterhood.” Its first usage as “women’s society in a college or university” dates back to the 1880s and is generally restricted to the U.S. Dan Goncharoff, posting on the American Dialect Society’s listserv last weekend, was able to antedate the published usage to an 1883 book, American College Fraternities. The name Sorosis is derived from the ancient Greek word for sisterhood and was also the name of a famous women’s suffrage group of the late 19th and early 20th centuries. Supporters of women’s rights in the early 20th century were often highly fashionable women who viewed clothing as an outward display of their modern views. The Sorosis brand trail grows indistinct after the 1920s. According to the Metropolitan Museum of Art, which has at least five pairs of Sorosis shoes in its collection, A. E. Little & Co. went out of business in 1934—whether because of a sale, a merger, or Depression hardships isn’t said. Read my post about another defunct shoe brand, Selz Shoes.